Laboratoire annuel de la création et de l’innovation au Centre Pompidou, « Mutations / Créations » interroge les liens entre arts, science, ingénierie et innovation. Le cycle réunit des artistes, ingénieurs, scientifiques et entrepreneurs, tous les protagonistes du sensible et de l’intelligible, qui infléchissent et transgressent notre présent. Pour sa troisième édition, la manifestation convoque les arts visuels et numériques, le design et la parole, à travers une exposition collective « La Fabrique du vivant », la première exposition personnelle et monographique en Europe de l’artiste brésilienne Erika Verzutti, ainsi que la troisième édition du forum Vertigo, mené par l’Ircam. "Mutations / Creations 3" summons up design, visual and digital art, through a group exhibition, "Designing the Living [La Fabrique du vivant]", the first European monographic exhibition of Brazilian artist Erika Verzutti, and the third edition of the « Vertigo » forum, organised by Ircam. In this digital era, a new interaction between creation and life sciences is in motion. The notion of ‘life’ is presented today in an artificial form where matter itself is explored. Biotechnologies are now a medium used by artists, designers and architects. If digital simulation tools allow us to recreate the living, we must ask ourselves the question : how do we programme the living? In partnership with Ircam, "Designing the Living [La Fabrique du vivant]" examines the changes in the concept of nature linked to technological production. The exhibition retraces an archaeology of the living and artificial life. Decidedly forward-looking, it presents the most significant creations and innovations in the field of art, design and architecture through works by some fifty designers. Its matter is changeable; certain works are undergoing a process of growth or deterioration. Among the hundred or so works on exhibit, some have been created especially for this event. Ircam presents Biotope, an installation by the composer Jean-Luc Hervé, which interacts along the visitor’s path, like a living organism. Between biology and genetics, design takes a cross-disciplinary approach, like a biotechnological artefact where living matter dictates the form. Design now makes use of ‘bio-manufacturing’ and of new ‘disruptive technologies’ around living matter. 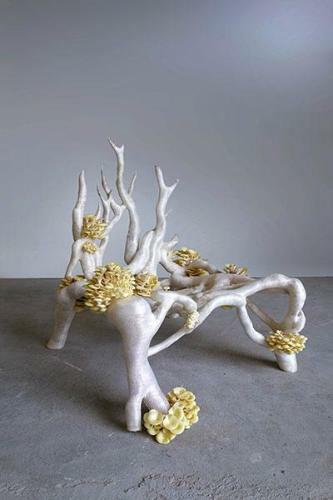 Bio-materials, produced from biological organisms (fungus mycelium and bacteria, etc.) have generated innovative objects, such as the Half Life Lamp (2010), a bioluminescent lamp formed from genetically modified material by the Dutch designer Joris Laarman. Sustainable objects by designers Jonas Edvard and Maurizio Montalti (Officina Corpuscoli) explore the potential of fungus mycelium, or the biodegradable objects by Eric Klarenbeek produced from microalgae are among many others. To create an architectural sculpture in situ, specially designed for the exhibition, the American artist David Benjamin (The Living) uses a new building method based on bricks which grow together and are assembled by bio-welding. Micro-organisms thus become an architectural medium and building material. The architects implement models based on the self-generating processes of matter, simulating the evolving systems of developing life. They produce new composites, made from both living and synthetic materials (the Aguahoja project by Neri Oxman with her laboratory at the MIT Media Lab) to develop environmental projects (energy efficiency, pollution-removing materials and bio-photovoltaics, etc.). The future of architecture lies in genetic engineering and synthetic biology, in order to produce new forms of nature between the ‘digital ecosystem’ and life systems. The installations on an architectural scale presented here are authentic biotechnological ecosystems. The London-based architects from EcologicStudio have built a structure through 3D printing, a sort of ‘cyber-garden’ integrating photosynthetic micro-algae. Marcos Cruz and his BiotA Lab at University College London present panels in bio-receptive concrete, designed to foster the growth of micro-organisms, moss and lichen in an urban environment. The French agency X-TU is leading research around organically-inspired architecture, in the firm belief that living organisms are the bio-technological revolution of the future. The congruence of living matter and technologies took hold in the field of artistic creation towards the mid-1990s. In 1998, Eduardo Kac advocated transgenic art, transforming natural organisms by inoculating them with synthetic genes or by transferring the genetic material of one organism to another in an effort to create new forms of life. In Australia in the early 2000s, The Tissue Culture & Art Project (Oron Catts & Ionat Zurr) explored life technologies as an artistic medium through the implementation of a new object/subject, a sort of ‘semi-living’. In this wake followed Amy Congdon’s research in cell regeneration, or the work of the designer Hongjie Yang, who created the Semi-Human Vase (2015) from human cells, thus crossing over a new boundary. Between nature and technology, a new ‘half-living’ artefact emerged, the result of automated manufacture and life-simulating software. Artists explored the hybridisation of human and plant cells (Spela Petric, Elaine Whittaker) using new technologies, or created self-generating works with endlessly developing forms (Hicham Berrada). Alexandra Daisy Ginsberg, Christina Agapakis and Sissel Tolaas recreated the scent of plants which had disappeared in the 19th century. The emblematic Crystal Works (2008-2012) by the Japanese artist and designer Tokujin Yoshioka constitute a highlight of the exhibition. He developed a unique production procedure which enables the development of organic forms through a crystallisation process, resulting in objects such the Venus Chair. A timeline retraces an archaeology of the living and artificial life, including naturalist photos dating from the 1930s by Jean Painlevé or Laure Albin Guillot and a video by Karl Sims. The German artist Andreas Greiner presents photos which capture life by electronic microscopy. Lastly, projects from the field of scientific and medical research are also featured.